Politics aside… but if your spouse/partner/significant other did what Kellyanne Conway’s husband is doing, how would you react? Kellyanne is famous as the first female campaign manager to elect a President of the United States. Prior to that, she was a prominent pollster and successful political consultant. She is perhaps the face most identified with the Trump administration and campaign. She is one of Trump’s staunchest loyalists and her White House job is to politically protect the president and his family, sell his policies, and project positive imagery for the administration. Her husband, is a conservative lawyer, who has come out from behind his wife’s shadow to become one of America’s foremost Trump bashers. 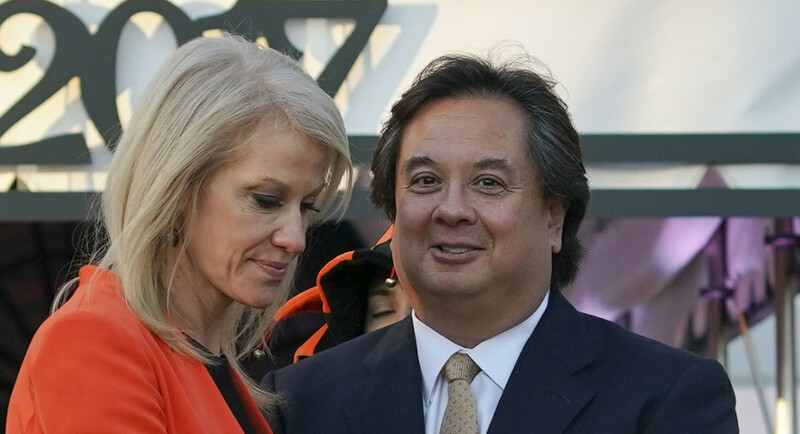 It is safe to say that his efforts would go largely unnoticed if he were not married to Kellyanne; but because he is Kellyanne’s husband, the mainstream propagandists eagerly embrace him and his ugly brand of NeverTrumpism. Now, in addition to his regular commentaries attacking all things Trump, he is forming a group of anti-Trump conservative lawyers to trash and oppose the President and his initiatives. How would you feel about this if you were Kellyanne Conway? She claims everything is fine between them and there are no rumors that this is negatively impacting their marriage. I don’t believe I would be as gracious or understanding if I were in her shoes. In a way, I envy and admire her capacity to give her husband the freedom to be “who he wants and needs to be” even if it contradicts her professional mission and personal creed. I don’t think I would be that tolerant or open minded if I were in her place. Actually, I do know; I would be mad as hell. First, I should acknowledge, I don’t know their circumstances or their marital understandings. Perhaps, they met through politics, shared political values, but not strategic approaches, and have always understood that their differences were tactical, not a major disagreement over fundamental values or doctrines. Maybe, when they first got together; he, not she, was an established and respected conservative voice. He was the one on center stage; and Kellyanne, while high profile for many years as a pollster and campaign adviser, was not known as an advocate for conservative policies or a spokesperson for political leaders. That may be the situation and it may explain why she is willing to accept her husband “continuing to be the man she married” even if it causes her to have some “explaining to do” to her boss, her colleagues, and the media who are always looking for trouble in the World of Trump. To be blunt, I probably would feel very angry and even betrayed if I were in Kellyanne’s shoes. If the circumstances had changed and our roles reversed, I would expect my spouse to respect my situation and my professional status more than his need to express his contrary political views. I would expect him to realize that his opposition to President Trump was only getting attention because of my role in the Trump administration; otherwise, he would be just another low profile Trump naysayer without an international platform. While it may not be easy for him to stifle his opposition, I would expect him to do so; and he would have the same right, under identical circumstances to expect the same from me. Marriage is a life long commitment. There are times when compromises are essential and necessary if the relationship is going to grow and get stronger. It often isn’t easy to do, but there are situations when the needs of one need to be given higher status than the needs of the other. For example, if you just got a job you love; but your spouse’s well established career unexpectedly requires that your family relocate soon, you relocate. If your spouse becomes ill and can no longer be the principle breadwinner, you adjust your lifestyle and your own career options accordingly. Yet, she appears to be fine with it and it is her marriage, not mine. Two things are certain, if I were Kellyanne, I would address the following with two important men in my life. First, I would go to President Trump and ask him to not refer to my husband as “Mr. Kellyanne Conway” as he has been doing since my husband first started writing and expressing negativity about the President and his policies… it is not helpful. And second, I would go to my husband and ask him to stop attacking my boss publicly and undermining my work in the White House. I would want to understand why it was so important to him to even go to the point of organizing a group of lawyers to oppose my boss. Was it because he felt ignored or less significant or undervalued in our marriage? If that were the case, I would be willing to make changes to address those issues… find out what I could do to let him know that he is still the most important person in my life and that I was sorry if I had done anything to make him feel less loved or less important. But I would expect him to understand why his public criticism was problematic and also unhelpful. The Conways have a beautiful family and she claims she is as happy as she has ever been in her professional and personal life. So be it; but I don’t recommend this for most marriages and most definitely not my own.